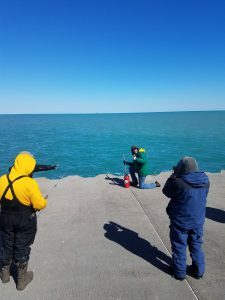 Charter fishing season is still a few weeks a way, but that hasn’t stopped plenty of hard-core fisherman from getting an early start fishing the salmon the hug the shoreline in the later winter and early spring months. We took a trip out to the wall at Belmont Harbor this last weekend to see the powerline fishing in action. Some of these guys had been fishing as early as February! Powerline fishing from the shore can be long and tedious (at times), but it does get people excited for the upcoming season. Many of the fisherman will either be captaining a vessel in a few weeks or working as a first mate. Powerlining for fish is very different from setting rods and trolling on boat. The first photo below is someone shooting out the line with a weight tied to a long, 100ft rubber strand. The strand is then attached to a string of lines with hooks and set out almost 300 ft. The lines are then left until it triggers the rod or retrieved a couple hours later. 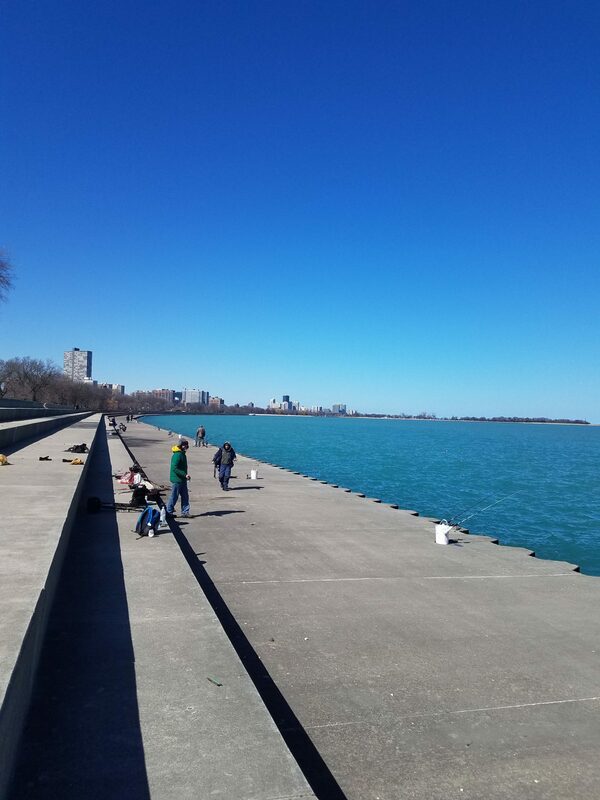 Seeing all the fishing going on along the harbor wall definitely got us excited for the upcoming season! The plan is to launch the boat this weekend and do some test fishing along the shore in northwest Indiana off Portage.